Omnibionta Pronatal Metafolin 60 tablets order online. • 1 tablet consisting of folic acid, Metafolin® and other essential vitamins and minerals. The growth of the baby in the womb is spectacular. In 38 weeks, he is evolving from a tiny cell to an entire organism of about 3.5 kg. It therefore speaks for itself that an adequate supply of specific vitamins and minerals is essential. Not only for the baby but also for the mother during pregnancy and subsequently during lactation (the mother produces 3/4 liters of milk per day!). During pregnancy, even with a balanced and varied diet, the necessary dose of folate, iron and iodine necessary for the mother and the growth in the baby isn't always reached. During pregnancy also an adequate intake of DHA (omega-3) becomes important because DHA contributes to the normal development of the eyes and brains of the foetus and breastfed infants. * Omnibionta® Pronatal + DHA contains specific and appropriate amounts of vitamins, minerals and DHA which are recommended during pregnancy to the end of breastfeeding. Take 1 tablet per day. To be taken with a cold liquid, preferably during lunch. 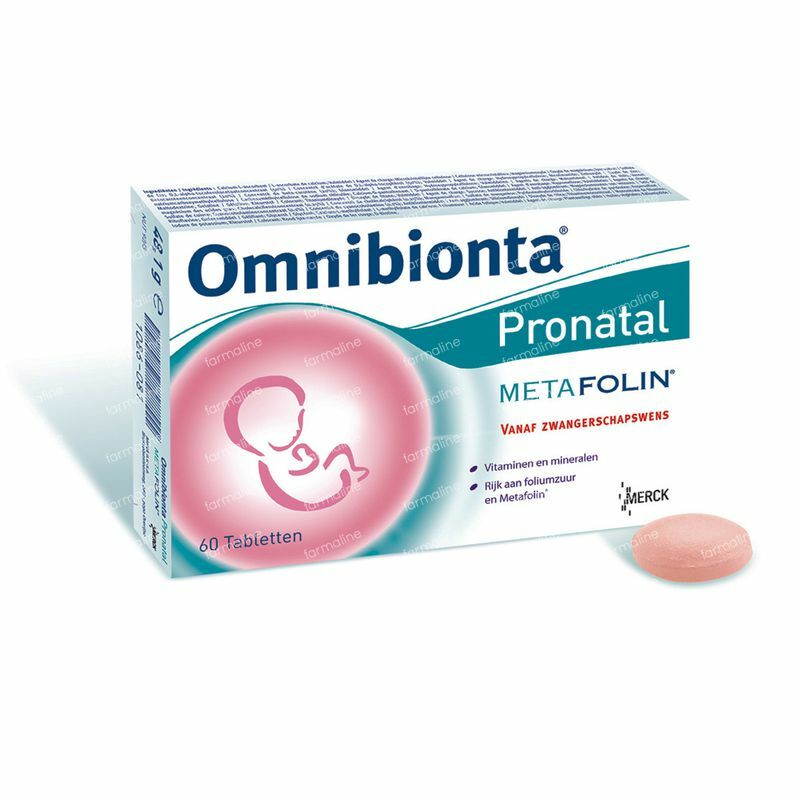 It is appropriate to start with Omnibionta® Pronatal starting from preganancy wish. Once the pregnancy is confirmed, you can switch to Omnibionta® Pronatal + DHA and this until the end of breastfeeding. Tablet: calcium L-ascorbate; Filler: microcrystalline cellulose E460; magnesium; Iron sulfate; Filler: Hydroxypropylcellulose E463; nicotinamide; D, L-alpha-tocopherol acetate; zinc oxide; Polishing agent: Hydroxypropylmethylcellulose E464; Fillers: Maize Starch, Maltodextrin; Calcium D-pantothenate; Filler: Cross-linked sodium carboxymethylcellulose E468; Caking agent: Magnesium salts of fatty acids E470b; Beta Carotene; Manganese Sulfate; pyridoxine hydrochloride; copper sulfate; sucrose; Thiaminemononitrate; Caking agent: Silica E551; riboflavin; Humectant: Glycerol E422; Glucose; Calcium L-methylfolate; folic acid; Gelling agent: Vegetable oil; Antioxidant: Sodium ascorbate E301, D, L-alpha tocopherol E307; potassium iodide; biotin; Colors: titanium dioxide E171, E172 Iron oxide; cholecalciferol; Cyanocobalamin. This product does not contain gelatine. This product does not contain gluten and should under no circumstances replace a balanced and varied diet and a healthy lifestyle. I'm very pleaded about Omnibionta Pronatal Metafoline. The vitamins which are necessary, they're all present in this product. I will definitely order it again. I started taking this product on the 3th month from my pregnancy on recommendation form my doctor. They are a perfect addition in combination with my healthy food, so my baby and I are getting all the necessary vitamins.